Nematoplexus with a wry twist ? When trying to find out something new about a fossil, one need not always have the very specimen at hand. Sometimes it is sufficient to have a published picture and look for features not noticed by the authors. (See Rhynie Chert News 8, 28, 29.) The picture in Fig.1 can serve as another example. Fig.1: Peculiar object described in  as "a spirally coiled smooth-walled tube of Nematoplexus". Width of the picture 235µm. Copyright owned by University Münster. A few introductory explanations are appropriate here. Nematoplexus  is one of a few Silurian – Lower Devonian fossils denoted nematophytes and lately listed among "Enigmatic Organisms" . It is made up of a tangle of wound tubes probably embedded in gel. It is a rare fossil, apparently known from only 4 samples of Rhynie chert, and only a few pictures are available. The type specimen found by Lyon  had been photographed anew with advanced equipment . Two of the pictures are shown on the website of Aberdeen University . Another specimen of Nematoplexus is pictured in , where it is not specified as such but presented merely as a nematophyte. It was dug from a separate stratum near Rhynie whose chert pods, according to , are named Windyfield chert. own sample with bigger variety of Nematoplexus (new species ? ), coil diameter 190µm. The spiral below right comes out of the surface near the centre of the picture so that part of it is cut away and hence not seen, which may be confusing when one tries to see the 3D-structure. 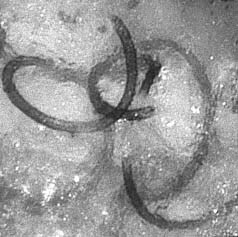 Width of the picture 350µm. Photograph by C. Kamenz, 2009. It must be mentioned that the thread of virtually all Nematoplexus filaments pictured so far is right-handed, and therefore it is felt that any exception to this rule might hint at something interesting. Even with the very few pictures available for comparison, it can be stated that the wound filament in Fig.1 is out of the ordinary in more than one way. First, it rather looks like a ribbon than like a tube. Well, a collapsed tube could become a ribbon but this one seems to be the only one which underwent such collaps. Second, the diameter of the thread or coil in Fig.1 is as small as 40µm while it is usually 80...120µm or up to 190µm in Fig. 2. Third, the type of thread of the wound filament seems to change suddenly from left-handed to right-handed, as if a screw and its mirror image had been joined. This peculiarity in Fig.1 was not noticed before as none of the authors [1-5] considered the type of thread. The rare deviation from right-handedness gives rise to the question of how it could be brought about. Imagine, for simplification, a ring with a cut: By displacing the ends out of plane this or that way, a left-handed or right-handed thread is formed, or rather one turn of a thread or coil. Likewise, a short thread fragment could change its screw type by some incidental deformation, which would explain the presence of an occasional left-handed short fragment, or end region of a longer filament, among right-handed ones. However, such explanation does not apply to the peculiar case seen in Fig.1. There remains the suspicion that the apparently obvious change of the screw type is an optical illusion due to the limited depth of focus. Here, only another inspection of the sample could provide an answer. It is the aim of this essay to point out that there is a problem with Nematoplexus which was not noticed before and which does not seem to have a simple solution. As with any tough problem, one can rightly expect something interesting behind it, hence it deserves attention. With some preparational effort, the samples presently available could provide more pictures of wound filaments, which might help to solve the problem posed by Fig.1. Further it can be expected that more specimens of the elusive Nematoplexus will be discovered, also by thorough inspection of the Rhynie chert samples already stored in collections.